In a saucepan bring water to a boil. Add rice and stir. Reduce heat, cover and simmer for 20 minutes. Meanwhile, season eggs with salt and pepper. Heat 1 teaspoon oil in small frying pan, pour in eggs. Coat the bottom of the pan with the eggs, in order to cook them evenly; cook for about 3 minutes. Flip the eggs, cook one minute more and remove them to a cool surface. Let them cool, then cut them into thin slices. Set aside. Spoon remaining 2 teaspoons oil into the skillet with the bacon fat. 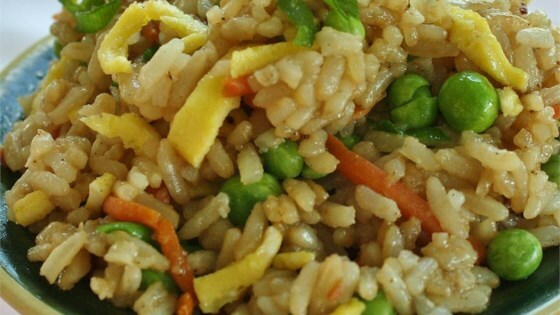 Stir in rice; break up any clumps and toss to coat with oil. Stir in bacon, soy sauce, peas, eggs and green onions. Stir and cook until heated through, approximately 3 minutes. This was easy. I altered it a bit. Next time I will add some carrot, red bell pepper and mushrooms.